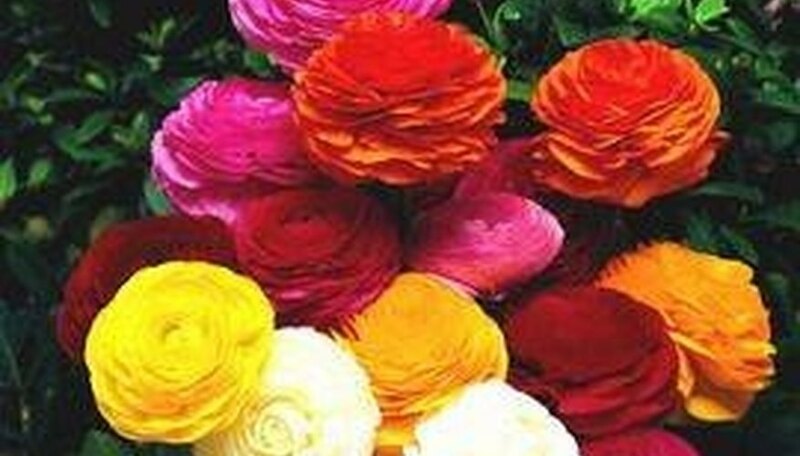 Ranunculus offer much to be loved by any aficionado of blooming plants. Rhizomes are readily available from winter to early springs, the blooming period lasts from two to three months and a dizzying multitude of colors and hues are available. Plant your rhizomes in the spring and they'll bloom in late summer their first year. Once established, ranunculus are not fussy, as long as they receive lots of bright sunshine and light watering. They'll thrive for years indoors if their modest requirements are met. Fill a large pot with a good quality, all-purpose potting soil. These plants typically produce long roots, so it's best to plant no more than 10 rhizomes in a 12-to-15 inch pot, 5 to 6 rhizomes in a 10-to-12 inch pot, and 3 or 4 in an 8-inch pot. Use clay pots, and make sure they have plenty of drainage holes. 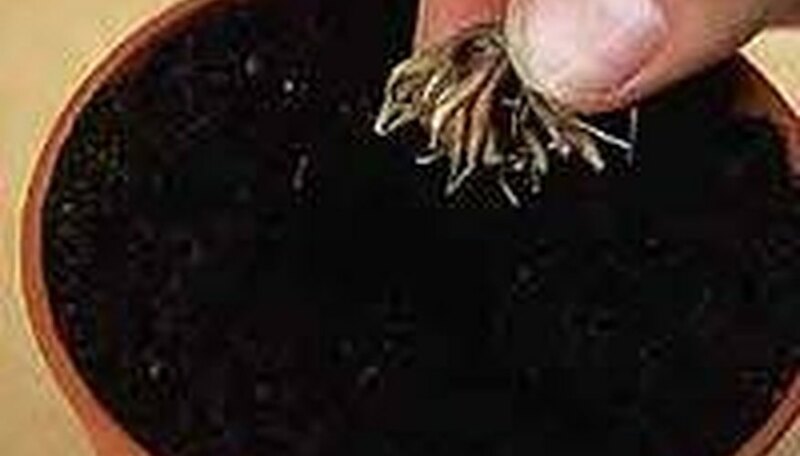 Plant the rhizomes 2 inches deep and 4 or 5 inches apart. The rhizomes are shaped like little bunches of bananas. Set them in the holes with the bananas pointing straight down, then fill the hole with soil and firm it gently. Give the planting medium a good soaking and apply liquid fertilizer according to the packaging instructions. Don't water the rhizomes again until you see shoots emerging, unless the planting medium approaches excessive dryness. Reapply fertilizer when the ranunculus begins to bloom. Place the pot where it will be exposed to full sun all day, if possible. If not, as long as the rhizomes receive the direct morning sun, they'll do very well. Ranunculus are happiest with about six to eight weeks of cool sprouting temperatures. Daytime temperatures between 45 to 50 degrees F and nighttime cools of 30 to 50 degrees F are ideal. Do not expose your ranunculus rhizomes to temperatures 60 degrees F of higher for extended periods. Water the ranunculus sprouts thoroughly, but only when the soil begins to dry out. When flower buds make their appearance in late summer, feed the ranunculus fish emulsion once only. Remove blooms as they become spent, and pull off the occasional yellowing leaf to safeguard against mold growth in the plant's thick foliage. Remove the foliage from the ranunculus plant after the leaves have turned yellow and died back at summer's end. Your ranunculus will be slipping into dormancy at this point. The plant will take a rest for several months, during which time you must not water it. Dig the rhizomes up and wrap them in a brown paper bag. Store them in a cool, dark, dry location to replant next spring--or up to a year later.